Green issues have been paramount in the design of the new Cambridge Mosque. Tim Winter, chairman of the Cambridge Mosque Trust, notes, ‘Islamic civilization has been based on the rejection of waste as an under-estimation of God’s blessing and so in the construction of the new mosque here in Cambridge, we were very much in the forefront of the local environmental movement’. The building will be naturally lit throughout the year from the large skylights integrated into the design in addition to being very well-insulated and heated and cooled using energy efficient and locally generated energy. ‘We are using the latest conservation technology and green roofs so that we’ll have an almost zero carbon footprint’, remarks Winter. The design intent is for environmental and energy concepts for the building and its integrated services to achieve low carbon emissions and none on site. The building will use high thermal performance materials. Energy input will be from mains electricity, delivering heat or cooling needs through renewable energy harvesting heat pumps, as an alternative to the use of gas boilers. Energy use will be minimised by using mixed mode systems – static heating and natural ventilation, supplemented by displacement cool air supply at times of high occupancy or high heat gains and natural light supplemented by low energy LED artificial lighting. The mosque is designed so that no artificial lighting will be necessary during daylight hours. The internal temperature will be controlled using locally generated energy from heat pumps in the basement. This type of heat pump extracts energy from the relatively stable temperature of the air or ground water which will heat or cool the building as necessary. Grey or rainwater will be harvested to flush W.C.s and irrigation for the grounds and landscaping. The building’s low initial carbon footprint will improve over time as mains electricity production from renewable sources increases. The new Cambridge Mosque will have ample space for bikes and will be easily accessible by foot. Upon entering the mosque, visitors will walk through a permeable green edge created by an enlargement of the existing community garden. This garden will include special selection column-shaped Betula pendula ‘_Fastigiata’ _– silver birch, a native tree, but a selection to emulate the middle eastern cypress trees. There is a sacred garden to the front of the mosque, aligned to four-fold symmetry with newly planted crab-apples standing over beds of Middle-Eastern and Turkish plant selections, to enhance the feeling of an ‘oasis’ that the building as a whole embodies. The gardens have been designed by Emma Clark Islamic Gardens in association with Urquhart & Hunt Landscape Design, a team of ecologically orientated landscape architects. Architects Marks Barfield have proposed various features in their designs to ensure that the landmark building will fit in naturally with the surroundings of the Romsey/Mill Road area. Thus, in terms of its height which will be no more than three stories, and its brick façade, the building will complement present neighbouring structures. 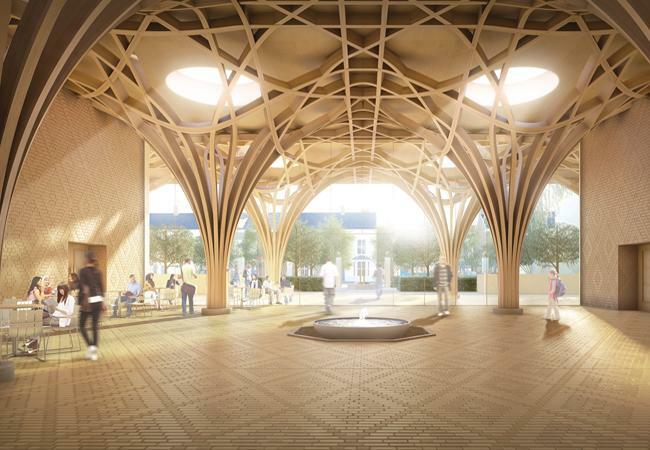 With its emphasis on sustainability and high reliance on green energy, the new Cambridge Mosque will be Europe’s first eco-mosque and a true landmark building for the city of Cambridge and its residents.